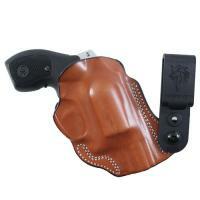 Carry sidearms discreetly and comfortably with the DeStantis Flex-Tuk™ J Frame Holster. Designed for maximum versatility, this in waistband holster (IWB) can be customized for appendix or cross draw style and anything in between. Whether you prefer your sidearm at 1 o'clock, or 9 o'clock positions, the Flex-Tuk™ will meet your needs. A specially designed J-clip places the grip at the belt line, ideal for either tucked or untucked shirt concealment. A uniquely engineered draw pattern allows for a firearm to draw towards the heel of the grip, providing shooters with a quicker sight picture as they clear the leather. A specially designed wide mouth opening prevents catches and allows for effortless draw and re-holstering. Constructed from premium quality leather, DeSantis' Model 113 is guaranteed to last. Comfortable and affordable concealed carry option for my S&W 442. Nice that it comes with two belt clips.